QuickTip: The instructions for installing an Extension can be found here. QuickTip: The instructions for installing a Template can be found here. 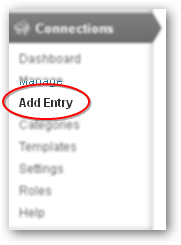 Our first step is to head to the Add New section of the Plugins menu in the admin sidebar. Once there, search for Connections. Connections will show up in the results, choose Install Now. Once installed, choose Activate Plugin to have Connections become active on your WordPress site. After activation, you will see the Connections menu items in the admin sidebar on your site. 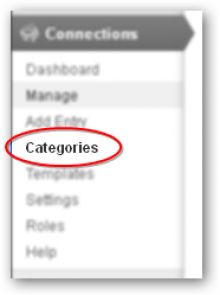 We will begin creating our Directory structure by adding Categories. 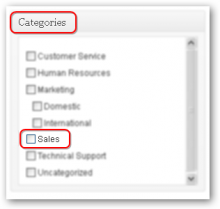 This is a important setup step for Connections, you will want to choose your categories with your end result in mind. For a corporation or business directory, for instance, you will want to have separate sections carved out for such groups as Sales, Technical Support, Sales or Marketing. Whereas, a local business directory would contain such examples as Electricians, Restaurants, Jewelers, etc. 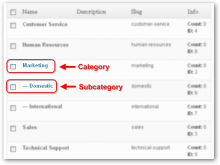 These categories build the backbone of your directory. As you can see from the example below, we’ve built a corporate structure which includes department categories as well as subcategories. 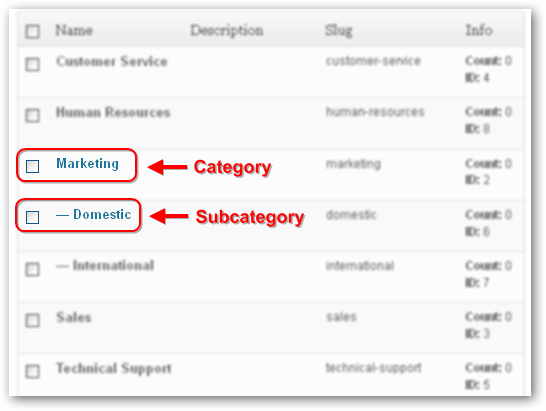 Subcategories are useful for further customization of your directory. Once the categories are in place, choose Add Entry from under the Connections menu item in the admin sidebar. Now, before jumping right in and adding entries, let’s take a moment to notice the area at the top right of the Add Entry page. 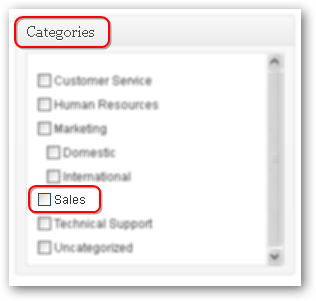 It is distinctly important to choose your Entry Type before adding information on the page. Choose each option and notice how the entry boxes at the left change. As you can see, choosing the type first definitely makes a difference. Again, if we were doing a staff directory, leaving the entry type set as “Individual” is just fine. However, if we are setting up a local business directory the “Organization” entry type would be the better option. The second highlighted area is also worth noting. This is the entry visibility. The default is set to “Unlisted”, which will keep the entry hidden from the live directory. 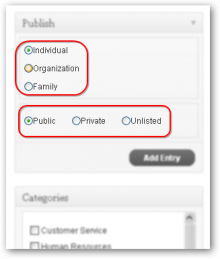 Make certain to change this to “Public” when you are ready to publish the entry to your directory. Choosing “Private” would require that the user be logged in in order to view the entry in the directory. Once you make the two choices discussed above, simply fill-in the entry’s information and then choose the categories the entry is to be assigned from those you set up earlier. Now that you’ve got your directory all set up and entered, its time to take a peek at what you’ve been working toward. Let’s begin by choosing Add New from the under the Pages menu item in the admin sidebar. Design this page as you would like it, add in the Title and text you wish to appear above the directory as well. Once all that is in place, you are going to place a “shortcode” into the page that will tell WordPress to go get the Directory you created and place it at that point on the page. This is accomplished by choosing the HTML tab in the upper right of your entry box. 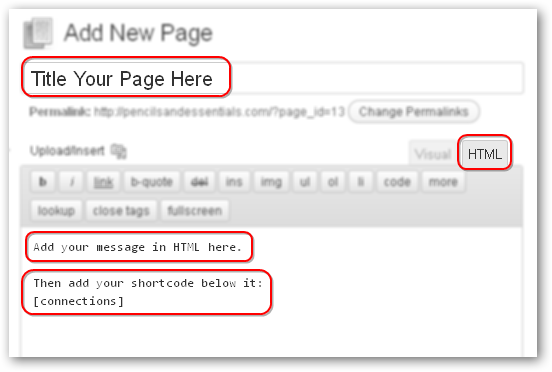 That is the Connections shortcode (in it’s simplest form) that instructs WordPress to retrieve your directory and place it on the page. From there it is just a matter of choosing “Publish” and viewing your results. Your site is now the proud owner new directory brought to you by Connections. The final step is to navigate to the Connections : Settings admin page and set the Directory Homepage option to the page in which you have embedded the directory on in Step 4.